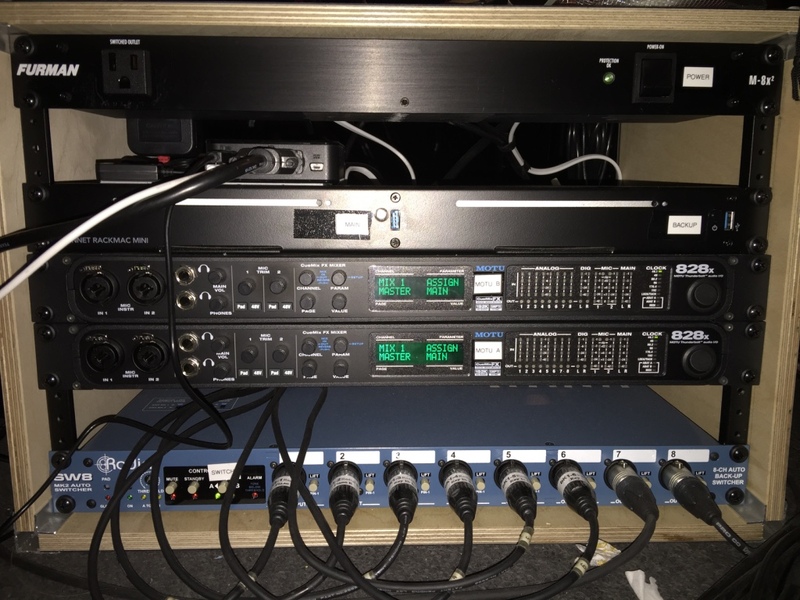 I’m often asked how to build a rig with a redundant computer and interface for using MainStage live. While there are a number of ways that this could be done, I’m going to detail how I’ve done this many times in the past successfully and reliably. Building your rig carefully and with attention to detail can often make the difference between being able to troubleshoot effectively onsite or having your rig crash and burn. If you can clearly see the signal path and can tell where every cable should go thanks to detailed labeling, it’s much easier to troubleshoot. Which of the above two rigs would you rather troubleshoot? It’s important to ensure that everything is working properly prior to installing in the rack. Otherwise, it will be a huge pain in the rear to take apart the rack to replace a faulty component. This is a little tricky the first time around, but if you read the instructions you’ll see it’s fairly straightforward. Be careful not to tighten the screws too much as they can be easy to strip on the Rackmac Mini. I strongly advise labeling everything you can possibly think of. Label as if you’ve been tasked with using up all of the P-Touch tape that exists in the known universe. You, your keyboardists, and your sound team will greatly appreciate this should you ever need to troubleshoot down the road. This step can make the difference between a simple diagnosis and a stopped show. IMPORTANT: After placing each label, apply a layer of glossy Scotch tape over the label to prevent it from falling off. Set the rack on the floor or on a low surface with the back facing down and the front of the rack facing up toward you. 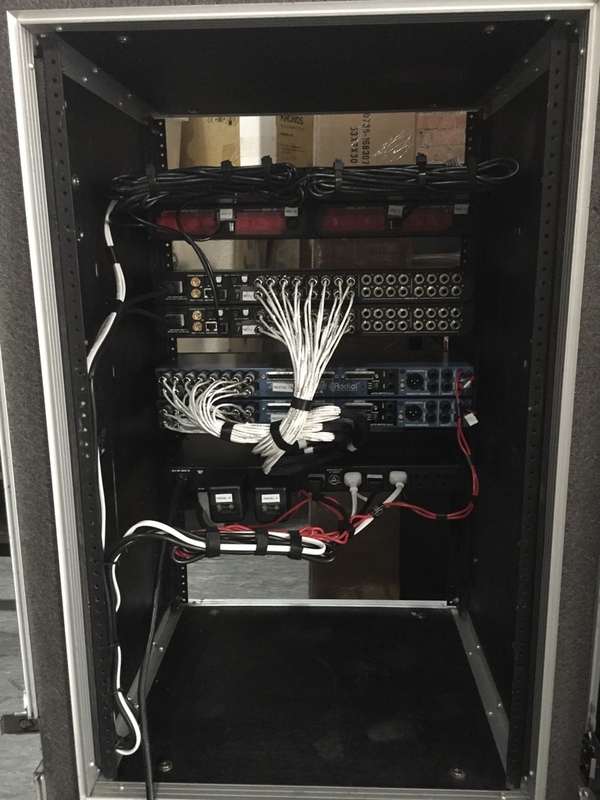 This allows for easy access to the components, easy wiring and cable management in the back, and allows space to run cabling from the Radial SW8 through the back of the rig. It’s also important to keep the Rackmac Mini at least a couple of rack units away from the top of the rack or it will be difficult to access the back of the computers. This also allows allows enough room on the rear rack rails should the sound department wish to mount a G-Block on a Steck Mount. Note that the Main MOTU goes beneath the Backup MOTU. This is intentional as that’s consistent with how the audio will be wired in the rear of the Radial SW8. Once you’re satisfied with where all of the components will go, secure them into the rack using the rack screws. Use the industrial strength Velcro for this, and ensure that there’s enough room for the MIDI cables to connect to it. This is where things get creative. You’ll want to connect and mount the cables one group at a time (computers power cables, interface power cables, audio, MIDI, etc). Make sure you can clearly see the path of the power and audio cables and can access everything easily. You may need to repeat parts of this process in order to fine tune it. Use the zip ties to connect cables to rack rails or the back of the RackMac Mini and use pieces of the roll of Velcro to hold together groups of audio and MIDI cables. Dressing the cables will serve two purposes: 1) keeping the back of the rack neat and easily accessible, and 2) helping to prevent cables from becoming disconnected while in transit. This step is only necessary if you’re using two Mac Mini computers. If you’re using two iMacs or two MacBook Pros, you won’t need a KVM switch unless you want to utilize one computer keyboard and mouse to control both computers. However, I recommend keeping things simple and using a separate keyboard and mouse for each computer if you’re using iMacs or MacBook Pros. Mount the KVM switch on the top of the Rackmac Mini using the industrial strength Velcro. Make sure that the USB ports are facing the front of the rack and are easily accessible. Coil the cable to the remote switch and mount the switch next to the actual KVM so that it’s easily accessible, but secure the cable coil behind the KVM by fastening it to the top of the Rackmac Mini with black electrical tape. Connect the KVM cables to the Mac Mini computers. You’ll need to use the Apple DVI to HDMI (or VGA to HDMI) adaptors to connect the KVM video connections to the Mac Minis. Carefully bunch and secure the cables to the rear of the Rackmac Mini using the zip ties. Use the 15’ (or 20’) MIDI cable to connect the MIDI out of the controller keyboard to the MIDI In of the MIDI Solutions Thru box. Connect one of the 3’ MIDI cables from MIDI out A of the MIDI Solutions Thru to the MIDI In of the Main MOTU. Use the other 3’ MIDI cable to connect MIDI out B of the MIDI Solutions Thru to the MIDI In of the Backup MOTU. Bunch the MIDI cables using a strip of Velcro from the Velcro roll. Use the included DVI (or VGA) cable to connect the monitor to the KVM switch. Also connect the ICE power cable from the video monitor to the power conditioner in the rack. Your rig should function properly at this point unless you’ve connected something incorrectly. 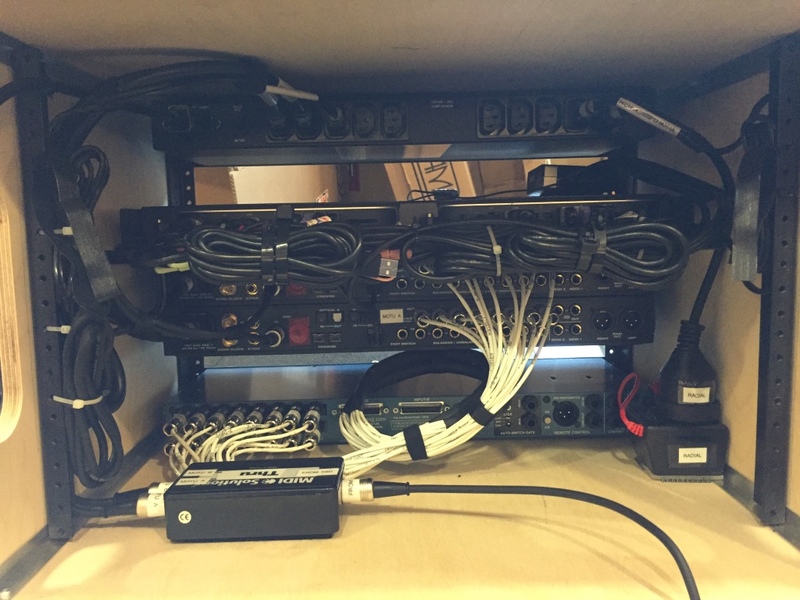 If you took the time to test the components prior to assembling the rack, you’ll be able to narrow down the culprit to having made and incorrect connection when assembling the rack. All you’ll need to do is trace your beautifully labeled and dressed cabling until you find the item that’s not corrected correctly. It’s during this step that you can determine the proper boot up and power down sequence. You should experiment with several different orders and power your rig on and off several times to ensure that it’s working correctly and consistently. Also be sure to test the audio each time, and test both the main and the backup components of the rig as well. When using MainStage live, it’s absolutely critical to be mindful of these seemingly small details. Be sure to take the time to really enjoy the process. If you rush, you’ll be more likely to overlook things and to make mistakes. Treat this as an art project and perform the steps beautifully and with attention to detail. It’s actually a very calming and peaceful process, and will serve you well in the future if you take the time to do it properly in the beginning. I also advise creating a QuickStart guide for your players. It should be one page in length and should address startup and power down procedure in clear, simple bulletpoints.